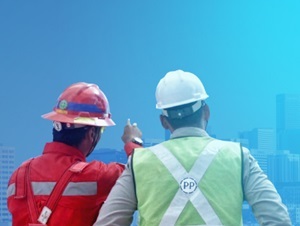 PT Pembangunan Perumahan (Persero) Tbk - PTPP or known as PT PP (Persero) Tbk is one of the largest Indonesian state-owned general construction firms. Established in 1953, PT PP (Persero) Tbk has grown for 65 years in Indonesia one of the largest general contractors in Indonesia in developing prestigious buildings, infrastructure, property and EPC. PT PP (Persero) Tbk has become one of the main players in national construction business. PT PP (Persero) Tbk is a public-listed company which is majority owned by the Government of Indonesia.PT PP (Persero) Tbk is listed on the Indonesia Stock Exchange (IDX) since 2010 under reference code PTPP. As today, the Government of Indonesia holds 51% shares in PT PP (Persero) Tbk. Other 0.08% remaining shares was owned by employees and employees cooperative and 48.92% by general shareholders. PT PP (Persero) Tbk is based in Jakarta and now has 5 divisions; operation divisions I, operation division II, operation division III, operation division IV and EPC division. PTPP also supported by 9 domestic branch offices spread across Indonesia. PT PP (Persero) Tbk's head office is located at Plaza PP - Wisma Subiyanto, Jl TB Simatupang 57, Pasar Rebo Jakarta Timur 13760. As of December 2017, PT PP (Persero) Tbk has 7 directly-owned subsidiaries; PT PP Properti Tbk, PT PP Presisi Tbk, PP Energi, PP Infrastruktur, PP Urban, PT Metro Kapsul Bandung and PT Sinergi Colomadu. In term of financial performance, achievement and performance of PTPP in 2017 shows positive results. According to information found in PT Pembangunan Perumahan (Persero) Tbk Annual Report 2017 as cited by JobsCDC.com, PT PP (Persero) Tbk managed to record total revenue of Rp21.50 trillion in 2017. This number reflected an 30.6% increase as compared with Rp 16.45 trillion in 2015. PT PP (Persero) Tbk booked total asset of Rp41.78 trillion, up 33.9% from Rp 31.21 trillion in 2016. Net income of PT PP (Persero) Tbk in 2017 amounted to Rp 1.72 trillion, grew 50.1% from Rp 1.14 trillion in the previous year. Bachelor degree (S1) of Computer Science, Information Technology, Electrical Engineering, or related fields. Graduated from reputable university. The candidates with prior experience for 1-2 years as a Network Engineer is an advantage. Possess certification in CCNA, CCNP, CISCO, or other equivalent certification is an advantage. Technical experience in switching, routing, networking (TCP / IP, LAN / WAN), firewall, bandwidth management, and monitoring system. JobsCDC.com now available on android device. Download now on Google Play here. Please be aware of recruitment fraud. The entire stage of this selection process is free of charge. PT PP (Persero) Tbk - Recruitment S1 IT Network Engineer PTPP January 2019 will never ask for fees or upfront payments for any purposes during the recruitment process such as transportation and accommodation.